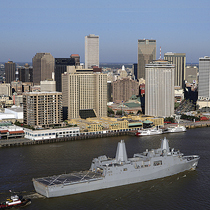 Did you know that Galvotec Anodes protect the $1.3 billion USS New Orleans? NEW ORLEANS (NNS) -- Sailors from USS New Orleans (LPD 18) and Marines from the 14th Regiment manned the rails of the San Antonio class ship March 10, bringing it to life during a commissioning ceremony in the ship's namesake city. The celebration of the first ship to be built and commissioned in her namesake city began with a 19 gun salute. The ship is the fourth ship to bear the name New Orleans and is the second ship to be commissioned in its class. Honored guests addressed ship's company, family members, and citizens of the "Crescent City." New Orleans mayor, Ray Nagin, spoke about the strong connection the ship and the city share. "I believe the ship and the city have a lot in common. We both survived Hurricane Katrina and we have both rebuilt after the storm," said Nagin. "Those experiences have endowed us with dignity, and today we both stand as examples of America's perseverance and faith." The ship's commanding officer, Cmdr. John B. (Brad) Skillman, agreed that the ship has strong ties to the city where she was built, christened, and commissioned. "This ship truly belongs to the city of New Orleans, never more so than after the hurricane," said Skillman. "[The ship] survived a CAT 5 hurricane because the ship's system design built to protect her worked." Adm. Gary Roughead, Commander, U.S. Pacific Fleet, not only noted the ship's ability to withstand the storm, but also looked forward to what the ship and its crew will accomplish in the fleet. The ship is scheduled to get underway March 12, and will ultimately sail to join the Pacific Fleet in its home port of San Diego. Skillman assured the city of New Orleans his crew is capable and ready to fulfill its role in the Pacific Fleet and U.S. naval history.